Pepperidge Farms has produced some pretty awesome cookies over the years. Milano’s, Brussels, Pirouettes and Chessman are just a few of my personal favorites. If I’m going to buy cookies, I would buy Pepperidge Farms. But to be honest … we don’t purchase many sweets especially since I know someone who does a dessert heavy blog. For more than a year I’ve had Milano’s on my list of ‘must-try’ desserts. 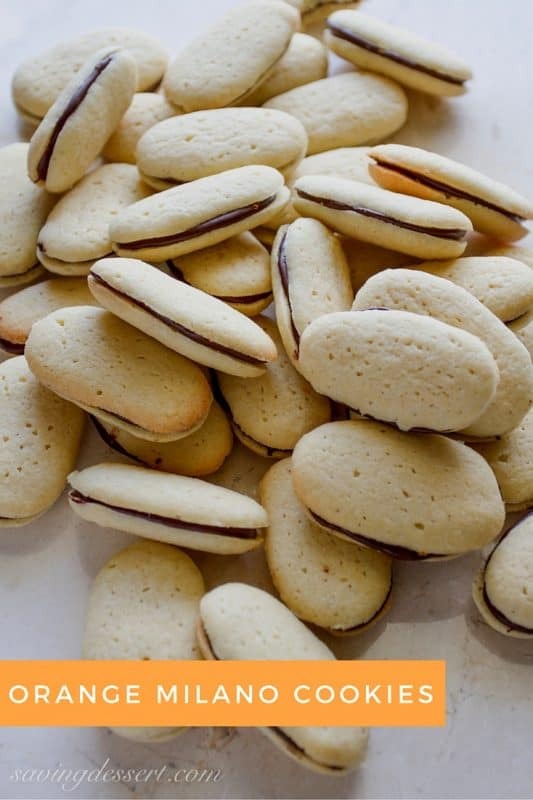 We’re having a few family members to dinner this week and these Orange Milano Cookies will be a simple, sweet end to our meal. 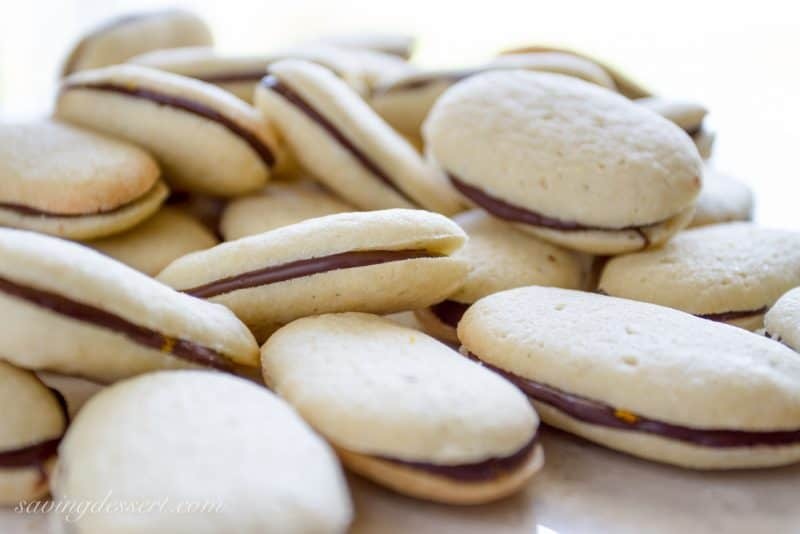 Who can resist a light, vanilla flavored cookie with a dark chocolate middle sprinkled with fresh orange zest? Not me! I marked two sheets of parchment paper with 3 rows of lines 2 inches wide, and 1 inch apart, then turn the paper over to pipe out the cookie dough. I would have 50 different sized cookies if I did this without a template! 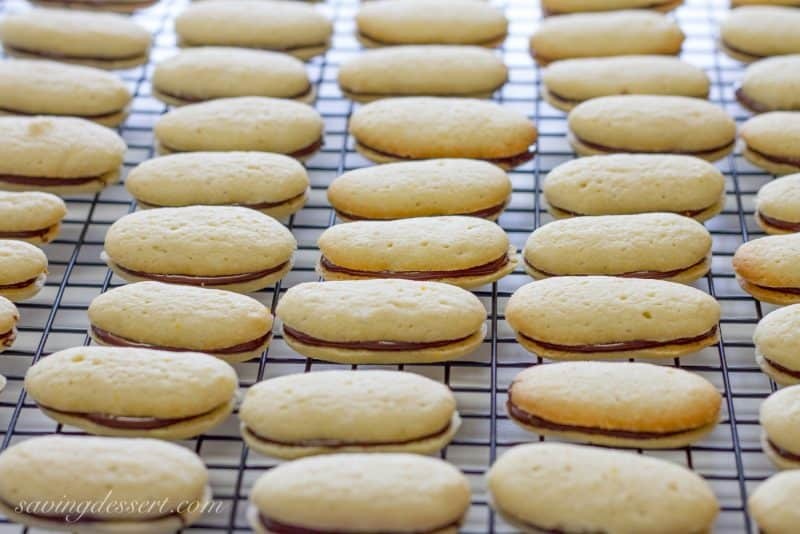 This recipe makes about 60 sandwich cookies, or 120 individual cookies a/k/a – “a bunch!” Match up cookie halves in pairs of similar shape and size. 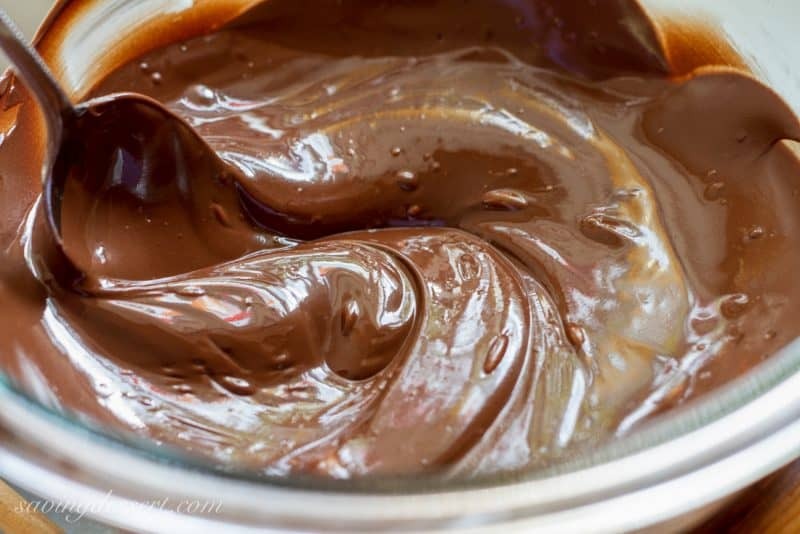 Melt dark chocolate chips over a double boiler, stirring frequently until smooth. Set the chocolate aside for about 10 minutes. Spoon the melted, slightly cooled chocolate onto one cookie half, then sprinkle with a pinch of orange zest. Gently press the other half on top and set on a rack until the chocolate is set. The cookie itself is very simple to make. The hardest part is spreading chocolate on 60 cookies which is a little time consuming but easy once you get into a rhythm. In a large mixing bowl combine the butter and sugar and beat with a mixer until light and creamy. Add the whole eggs, egg white and vanilla. Beat on medium-high until light and fluffy. Gradually add the flour mixture and beat on low until combined. Prepare two sheets of parchment paper marked on the back with 3 rows of lines 2 inches wide, and 1 inch apart, then turn the paper over and place it on a baking sheet. Scoop the batter into a pastry bag or large Ziploc bag with a 1/2-inch hole cut at the end. Pipe the batter into 2-inch long strips about 3/4 inch wide and 1 inch apart. Bake for 15-18 minutes or until the edges are lightly browned. 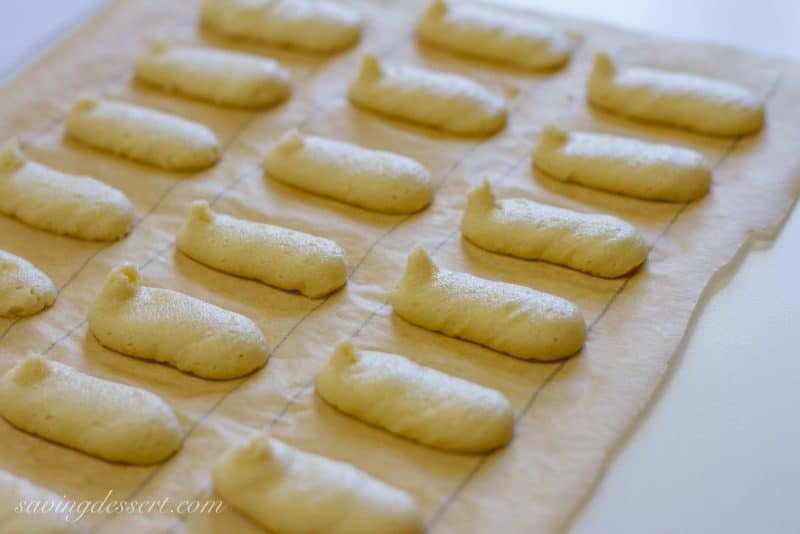 Remove from the oven and rest the cookies on the baking sheet for 5 minutes before transferring to a wire rack to cool. Match up the cookie halves in pairs of similar shape and size. Place the dark chocolate chips over a double boiler until melted and smooth. Remove from the heat and cool for about 10 minutes. Spoon the melted chocolate onto one cookie half and sprinkle with a pinch of orange zest. Gently press the other half on top and set on a rack until the chocolate is set. Repeat with the remaining cookies. Store in an airtight container. We love copycat recipes, it’s fun to make our favorite famous cookies at home. Another great copycat cookie is our Homemade Fig Newtons, and who wouldn’t love these Doubletree Cookies from The Little Kitchen? Girl Scout cookies are probably some of the best out there and these Copycat Girl Scout Tagalong Cookies from A Dash of Sanity look perfect! And one of my favorite cookies in the world are these Copycat Pepperidge Farm Brussels Cookies from The View from Great Island! We had such a great weekend! The weather was absolutely perfect. We went to a wedding reception and got dressed up and I even wore lip stick and high heels. Such fun to play dress-up. I also had a wonderful day with friends helping them make a Limoncello three layer cake. It turned out so pretty. Did you have a nice weekend? I hope your weather was awesome. These beautiful days are so wonderful compared to the winter we had. I know you can relate! I hope you have a great week – thanks so much for stopping by! Very easy to follow directions. I made the recipe exactly as you indicated and the cookies were a big hit. Thanks Janis – so happy you liked them and really appreciate you taking the time to comment. Feedback is so important to me. Thanks again – have a terrific weekend! You could pipe the chocolate on with a disposable pastry bag or use a paint brush to spread it. There is just something about the crunch of the cookie and dark chocolate inside that makes Milano's special! What fun to make them at home! Even more than a biscotti, I think a Milano is the perfect cookie with an espresso. 🙂 Yours look delicious! Love the textures and lines in your spoon challenge photo too!<br />Have a love and smile filled Mother's Day, Tricia! You rock. 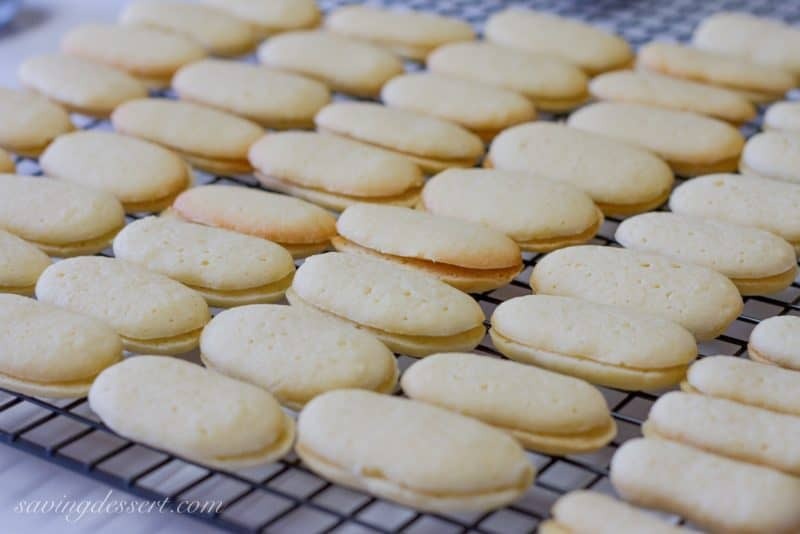 I had asked someone on some site if they had any idea how to do the Milano style cookies. Once of my favorite cookies. Good job. Tricia you're on a roll this week! These are absolutely fabulous, if you KNEW how much money I've spent on Milanos over the years 🙂 Yours look spectacular. I have always been such a sucker for Milanos, yours look perfect Tricia. Love your spoons too, another thing I"m a sucker for – fun props! OMGOSH,<br /> I can't believe it. These are my son's all time favorites. I hope mine turn out as fab as these!! I love milano! These look so perfectly done, Tricia. Orange Milanos are my husband's favorite- he may get these for his birthday. 🙂 Love your spoons too! Oh Tricia! Only you would do this to me. These look so good! And those spoons look awesome. You should blow it up and hang it in your kitchen! Love these cookies, what a great recipe. And the photo of the spoons is lovely, you know I just adore spoons, all kinds. Hence the name mysavoryspoon. 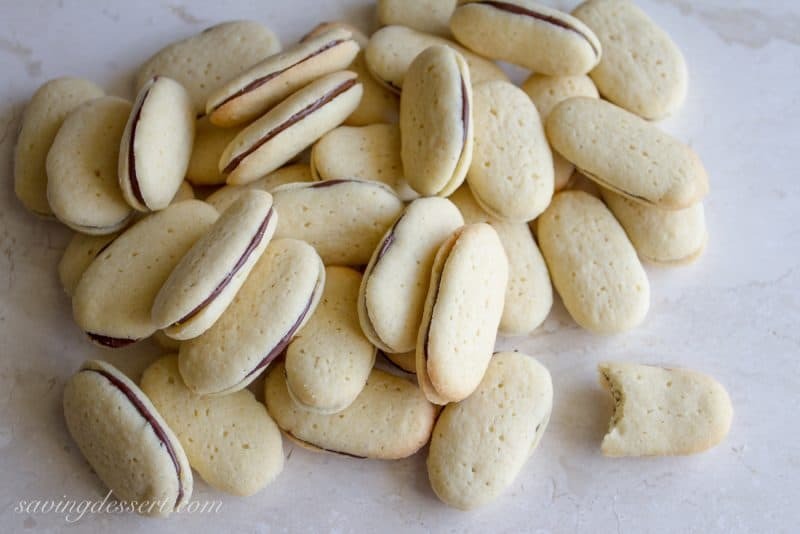 OMG we LOVE Milano cookies- doesn't everyone? These are the best!! Some of the best Italian desserts are chocolate and orange combined. Great recipe! Thanks for sharing!